A couple of months ago a friend directed me to a piece by the New Yorker which included a nice interactive map depicting the landscape of craft brewing in the United States based on data provided by the Brewer’s Association. 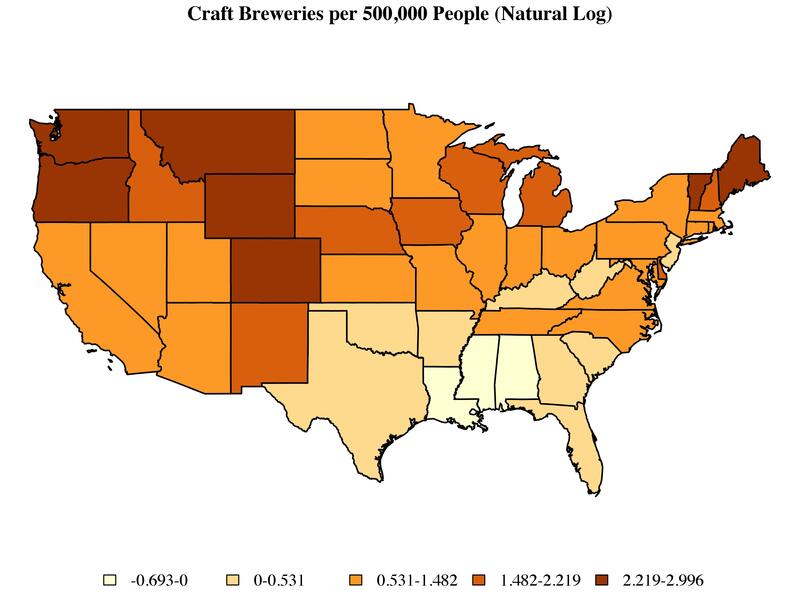 Using this data, what can we say about the geography of craft brewing in the United States? There are a couple of points to note here. First, I’ve omitted Alaska and Hawaii. Disconnected observations can become a bit of a headache when working with some of the methods described below. There are ways around this, but for the purposes of this post I’d prefer to set these issues aside. Second, instead of dealing with raw counts, I’ve taken the log of the number of craft breweries per 500,000 people. Finally, I’ve used Jenks classification to sort states into five categories, each of which is associated with a color determined by the ColorBrewer routine implemented via the brewer.pal command include as part of R’s RColorBrewer library. Just looking at the map, we can see clusters of high-craft-brewing states in New England and the Pacific Northwest, as well as a large cluster of low-craft-brewing states in the South. We can begin to quantify these patterns by using a set of exploratory techniques designed to capture the extent to which observations which share similar values on a given outcome also tend to share a similar spatial location. Geography: obviously geographers were into space before it was cool. A couple of pieces I like are Doreen Massey’s book, For Space and O’Sullivan (2006) for a review of GIS. Anthropology: the proceedings of a conference including a piece by Clifford Geertz, Senses of Place (1996). Though what I’m writing here has less to do with the space/place debate. …and it’s a really great paper! Flaxman reviews three standard measures for spatial and temporal independence and then proposes a new measure that can simultaneously test for spatio-temporal dependence. The measures are validated against real crime data from Chicago. On the other hand, it’s also completely useless for my project. I mean, I stuck it in a footnote, but I can’t engage with it in a substantively meaningful way because my paper is about the Modifiable Areal Unit Problem and the good ol’ MAUP is fundamentally about polygons — not points. The MAUP occurs because a given set of points can be aggregated into any number of different polygon units, and the subsequent results of models, bivariate relationships, or even hot spot analysis might change based on the aggregation method. This means that Flaxman’s approach and my approach are not comparable because they each rest on different assumptions about how to measure distance, social interaction, and spatial dependence. They’re based on different spatial ontologies, if you will. But back to the main argument of this post: could we play around with the models in Flaxman, the models I’m making, plus some other models in order to test some of the implications of our ideas of space? Here are some hypothetical hypotheses…. Isotropy. Isotropy means that effects are the same in every direction. For example, weather models often take into account anisotropy because of prevailing wind direction. As Flaxman mentions at the end of the paper, alternative distance measures like Manahatten distance could be used. I would take it a step further and suggest that distance could be measured across a trend surface which might control for higher crime rates on the south side of Chicago and in the near-west suburbs. Likewise, spatial regression models of polygon data can use polynomial terms to approximate trend surfaces. Do the additional controls for anisotropy improve model fit? Or change parameter estimates? Spatial discontinuities. A neighborhood model posits — albeit implicitly and sort of wishy-washy — that there could be two locations that are very close as the crow flies, but are subject to dramatically different forces because they are in different polygons. These sharp breaks might really exist, e.g. “the bad side of the tracks”, red-lining, TIFF funding, empowerment zones, rivers, gated suburbs. Or they might not. Point process models usually assume that space is continuous, i.e. that there are no discontinuities. Playing around with alternative models might give us evidence one way or another. Effect decay. In spatial regression models like I’m using, it’s pretty normal to operationalize spatial effects for contiguous polygons and then set the effect to zero for all higher order neighbors. As in the Flaxman paper, most point models use some sort of kernal function to create effect estimates between points within a given bandwidth. These are both pretty arbitrary choices that make spatial effects too “circular”. For exmple, think of the economic geographies of interstate exchanges in middle America. You’ll see fast food, big box retail, gas stations, car dealerships, hotesls, etc. at alomst every interchange. Certainly there is a spatial pattern here but it’s not circular and it’s not (exponentially, geometrically, or linearly) decaying across distance. Comparisons between our standard models — where decay is constrained to follow parametric forms — and semi-parametric “hot spot” analyses might tell us if our models of spatial effects are too far away from reality. (Dormann et al 2007) undertake a herculean task by explicating and producing R code for no less than 13 different spatial models. (Hubbard et al 2010) compare GEE to mixed models of neighborhood health outcomes. (Tita and Greenbaum 2009) compare a spatial versus a spatio-social network as weighting matrices in spatial regression. The problem with this approach is that the data is often old, simplified data from well-known example datasets. Or worst yet, it is simulated data with none of the usual problems of missing data, measurement error, and outliers. At best, these papers use over simplified models. For example, there aren’t any control variables for crime even when there is a giant body of literature about the socio-cultural correlates of spatial crime patterns (Flaxman and I are both guilty of this). The second type of research would be just the opposite: interested in the substantive conclusions and disinterested in the vagaries of spatial models. They might compare hierchical or logistic regressions to the spatial regressions, but very rarely go in depth about all the possible ways of operationalizing the spatial processes they’re studying. And when you think about it, you can’t blame them because journal editors like to see logical arguments for the model assumptions used in a paper – not an admission that we don’t know anything about the process under study and a bunch of different models all with slightly different operationalizations of the spatial process. But here’s the thing: we don’t actually know very much about the spatial processes at work! And we have absolutely no evidence that the spatial processes for, say, crime are also useful in other domains like educational outcomes, voting behavior, factory siting, human pathogens, or communication networks. Good luck, and go play! Posted in Datasets, General, R, Spatial Statistics. In a previous post I made a reference to the estimation of equilibrium effects in the context of a spatial lag model. This is a question which has received surprisingly little attention given that the standard approach to interpreting parameter estimates is generally inapplicable in this setting. The problem is that in a spatial lag model, the effect of any given variable depends on the structure of geographic relationships in the underlying data. To the extent that these relationships vary across observations, the relationship between some independent variable and some dependent variable varies across observations as well. Posted in R, Spatial Statistics.